Have the children sit in a circle around the pan of water. Take turns rolling the die until someone rolls a 6. 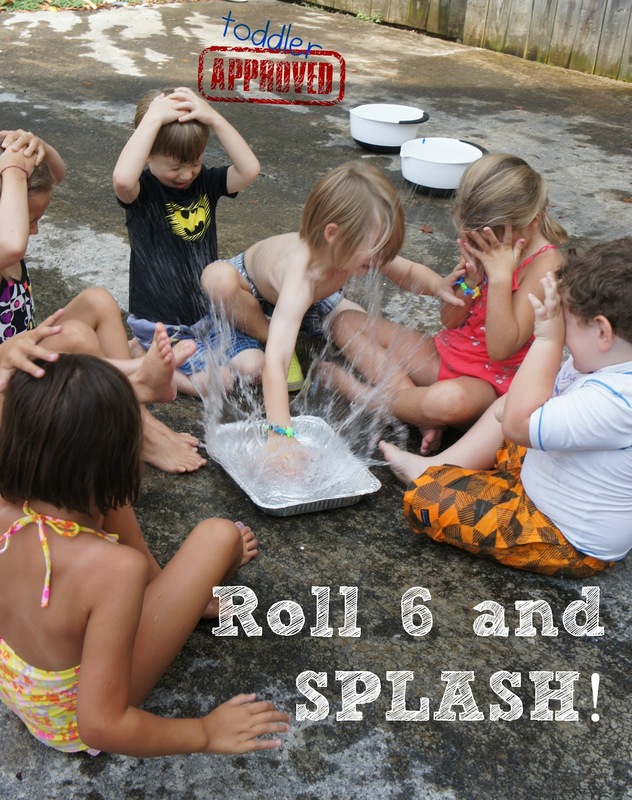 The lucky person who rolls a six then gets to slap their hand in the pan, and splash everyone else. 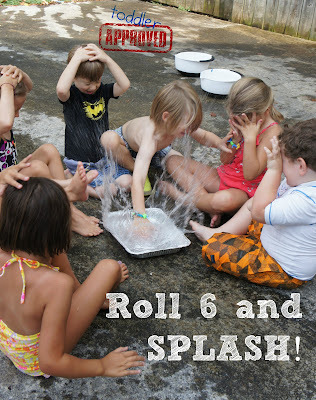 Continue refilling the water and rolling until everyone has had a turn to splash. This game was not only great for number recognition, but for practicing turn taking and being patient. Advance Preparation - Using a permanent marker write uppercase letters on the paper plates and matching lowercase letters on the water balloons. On fence (or other hard surface) tape paper plates and shark cut outs (I tried to have at least one shark near each lettered plate). 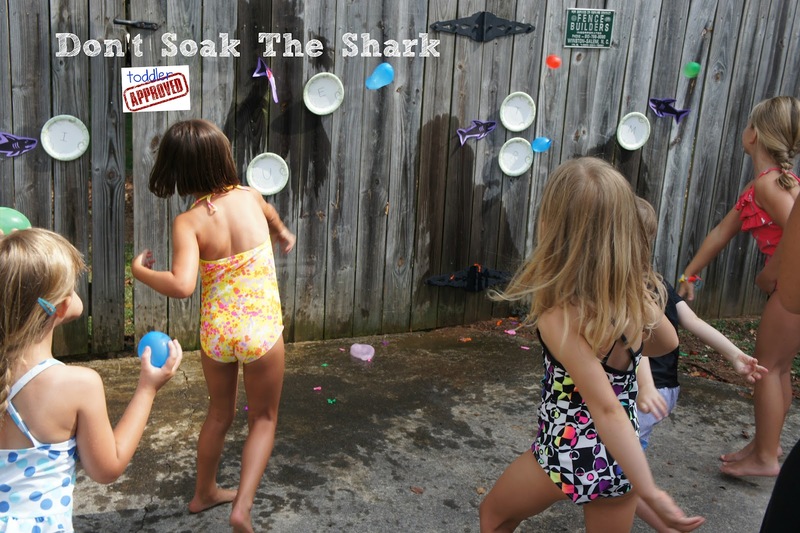 The object is to identify the lowercase letter on the water balloon and then throw it at the plate with the matching uppercase letter, WITHOUT "soaking the shark". When someone accidentally gets the shark wet (instead of the plate), everyone yells, "Don't Soak The Shark". Caution: The combination of water balloons and small children (or large children, or even adults) can be a recipe for chaos. Some ways to help keep this game under control are setting firm rules ahead of time as to where the balloons can be thrown, giving the children only one balloon at a time, and taking turns throwing the balloons. 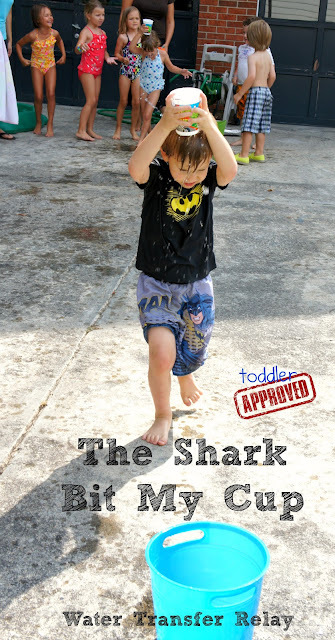 This is a basic water transfer relay with a shark-y twist. Materials Needed: Two small buckets, one large bucket/container filled with water, two cups (with several small holes poked in/near the bottom of each cup). Divide children into 2 teams. Each team starts standing on either side of the large container full of water. Place the small buckets a short distance away. On go, the children must fill their cups with water, place it on their head and run to their team bucket on the other side (attempting to keep as much water in the cup). Once they reach their bucket they dump out what is left in the cup, run back to the starting line, and pass the cup off to the next person. The game ends when one team fills their bucket to the top, or whoever fills their bucket the fullest after a set amount of time. The twist on this game was that I poked several small holes in the bottom/sides of each cup to look like a shark had attempted to bite it. Not only was water spilling out of the top of the cup, but the bottom and sides as well. Of course, the water games were only one small part of the party. 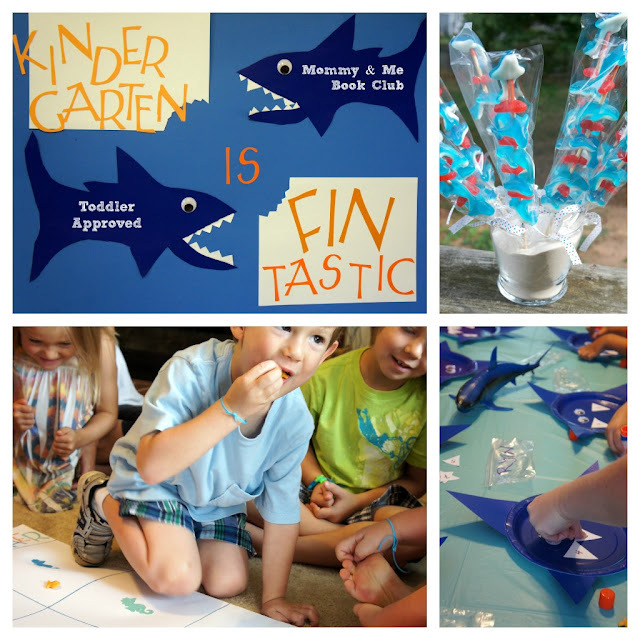 To see all of the shark themed crafts, learning activities, games, treats and fun decorations that Danielle came up with - you'll find the details here. How fun! What a great idea for summer. A great way to keep those summer playdates fun! Thanks for the post! What awesome ideas! Pinning it onto our board for The Jenny Evolution. These are awesome! 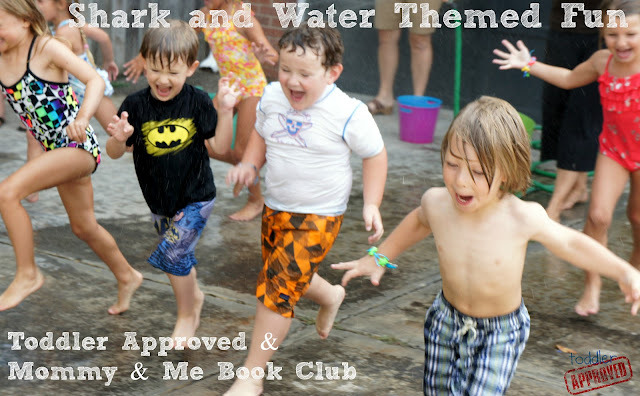 Can't wait to incorporate them into my Mommy Summer Camp ideas! Thanks for sharing! Thanks so much for sharing such great ideas! Can't wait to try them out with my class during shark week!